What Is Your Horse’s Frog? Not the jumping green critter found in swamps, but the frog of a horse. This part is located on the sole of a horse’s hoof. It is on the underside and forms the shape of a ‘V’. Perhaps you are already familiar with this part of their hoof, but are aware of its purpose? Let’s take a closer look! The frog acts as an absorber each time the horse bares weight on that hoof. It evenly spreads the pressure across the hooves. Ultimately, this reduces the strain put on the joints and bones of the legs. This highly functional part also helps with circulation. It encourages the flow of blood through the legs, much like a pump. Just above the frog is a fibrous part that holds blood sent back up the leg once the frog has weigh put on it. It may also help with traction. The texture helps to prevent slips, especially in barefoot horses. The farrier should leave the frog large and able to touch the ground. They may use special shoes to help distribute the weight off the walls and soles of the hooves and more onto the frogs. This helps to reduce pressure on the coffin and navicular bones. Horse owners should watch out for thrush, a common bacterial infection that can affect the frog. Muddy and wet conditions allow the bacteria to thrive. An unpleasant odor from the hoof and a black area are signs of the infection. You will need to thoroughly clean and treat the area. 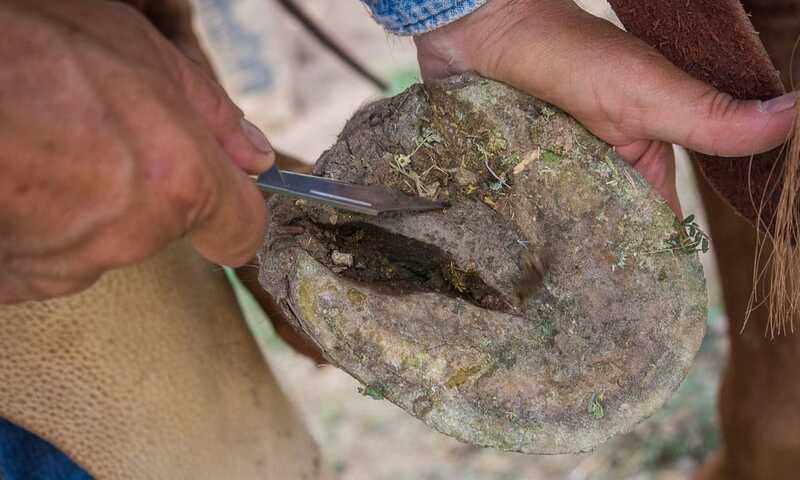 Learning the parts of the hoof is important in keeping your horse sound and happy! Keep a good eye on the frogs of your horse’s hooves to make sure it can serve its purpose correctly.